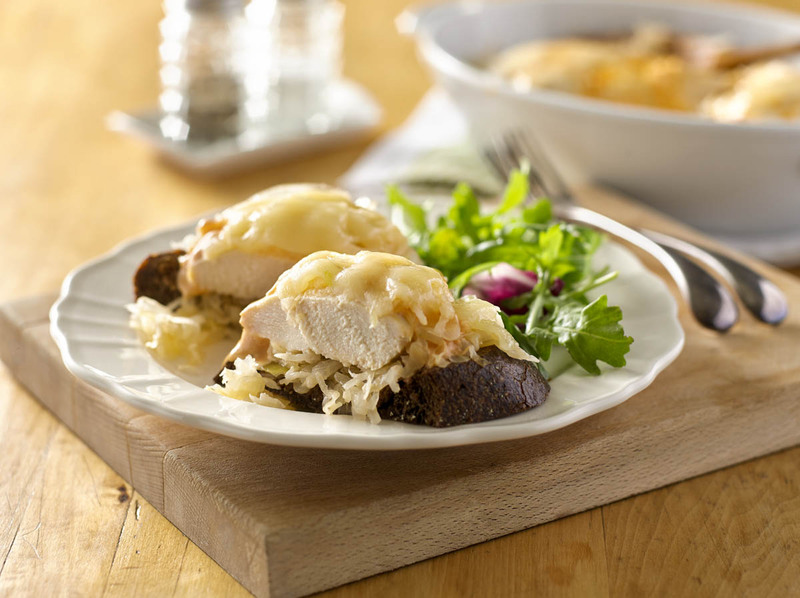 This easy-to-make casserole dresses up tender chicken with the classic combination of sauerkraut, Swiss, and Thousand Island dressing. Place chicken breasts in square baking dish; season with salt and pepper. Top chicken with sauerkraut, Swiss cheese, and Thousand Island dressing. Cover baking dish and bake for 30 minutes until chicken is done. Serve on top of thick slices of toasted pumpernickel bread. A second slice of pumpernickel may be added to create "sandwiches." Fresh baked apples or canned apple sauce are a sweet complement to this tangy dish. For a lower sodium version of this dish, simply rinse sauerkraut (after it has been drained) in cold water to remove most of the salt.